I’m clearly doing a poor job of keeping my resolution to post more frequently. In fact, TotalCon has come and gone and I’ve said nothing about it. Terrible! 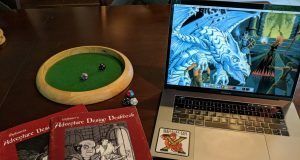 I do want to write up some details of my TotalCon experience, but it probably makes much more sense given the context of what my life was like in the week leading up to TotalCon. And as you can probably imagine given my rate of posting here, what my life has continued to be like since. The weekend before TotalCon was a three day weekend, and yet, was not full of rest and relaxation. There was some, but I was also losing sleep over an issue at work that I had to deal with over the weekend. A co-worker, in fact a guy that reports to me, was going to be terminated on Tuesday and I got to be part of the process. I didn’t have to do the firing myself, but I was in the meeting with the guy doing the firing and the guy getting fired. It’s the first time in my career I’ve been involved in such a process, and it was not fun. The rest of the four day week was full of meetings, and not at work mind you, but after work. My personal project had a meeting via Google hangout on Tuesday night, and the members of the panel I’m going to be on at PAX had one on Wednesday night. Thursday night I got to drive out to meet with a guy about rescuing my 401k from 38 Studios which has at last become un-frozen. It was a productive and heartening experience, though a bit long. I was happy to go to all these meetings, but it basically meant a solid week of no mental down time at all. Wake up, commute, work, commute, meeting, sleep. Not a fun cycle. Finally Friday came, and the whole day was full of problems at work that required my immediate attention. This on a day I had a hard leave-by time of 4:00 so I could get down to TotalCon in time to convince the hotel staff to give us a non-smoking double instead of the smoking single we had reserved (it was all that was left), eat dinner, and make it to a 7:00 game. The stress levels were high all day. I finally tore myself away from work at about ten after four and was driving along 95 towards Mansfield and feeling like I could start to relax and enjoy my weekend when my cell phone rang. It was my darling wife, whom I don’t blame at all as this could happen to anyone, calling me to tell me she had locked herself out of the house. Relaxation was gone as I raced home to let her in, all the while screaming and cursing at the drivers on 109 that seemed to think it was not just half an hour until the worst of rush hour traffic would settle in and it was OK to drive a leisurely 30 MPH. Despite the detour, I made it out of there and back onto the road and down to Mansfield by 5:30. My trusty travel companion had made it down ahead of me and managed to work his charms on the hotel staff and get us our room upgrade. All in all the time lost was no more than I was allowing for traffic anyway, so no real harm done, except maybe for winding my stress level back up to 9. I still can’t believe that THAT was the day I finally managed to lock myself out after all these years. Argh. And all for nothing since I didn’t get to ride anyway!! Yowza! That is a very stress-filled day/week indeed! Sorry to hear about all the stresses. I now know what survivor’s guilt is like, too, so you’re in good company. Hope the time since has brought relief.